Students in Mrs. Haddad’s ESL class had an assignment to write a “news story” about an unbelievable event that is not true. Here is one of the stories that Istahail Ali wrote. By Istahil Ali, Apple Valley H.S. A big bird grabbed a girl from her room and carried her off for a ride. It started when Asher, a 15-year-old-girl from Kenya, was sitting in her room. Asher saw the big bird flying in her window and she was scared. She tried to run out of her room, but she could not. Asher screamed, and said, “No!” but nobody head her because all her family was sleeping, the big bird took Asher on its back. It flew to sky. Asher said that her heart was pumping like an African drum. Ahmed Abdi, a neighbor, saw when Asher and the bird were flying. He described the bird, and said the bird looked like a horse and it was beautiful. It had blue, red and gold feathers. Asher was a smart girl. 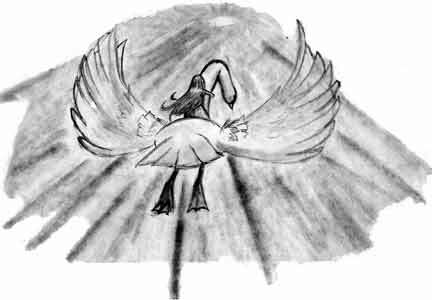 As she was flying she held the bird’s neck tightly. She said that the sky was beautiful and she was not scared any more and it was fun to fly. Asher saw different birds. Some had beautiful feathers and others had shining bodies. She said the sky was cloudy. When they came back to her room. The bird said, “Tonight we had fun and I think you enjoyed it and had a nice night. I hope we see each other again.” Asher said that she was as happy as a queen.